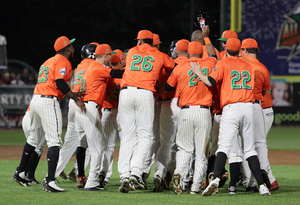 (Central Islip, N.Y., July 11, 2018) – The Liberty Division defeated the Freedom Division 4-3 in walk-off fashion on Wednesday night in the 2018 Atlantic League All-Star Game, presented by Good Samaritan Hospital Medical Center. The game was played before a past-capacity crowd of 6,414 at Bethpage Ballpark in Central Islip, N.Y., the home of the Long Island Ducks. The Liberty Division took an early 1-0 lead on a first inning home run to right field by Somerset Patriots outfielder Julio Borbon. The Freedom Division responded with a three-run third inning, highlighted by a two-run single from Southern Maryland’s Frank Martinez and a run-scoring groundout from York’s Welington Dotel. It stayed that way until the bottom of the fifth when an RBI double by Somerset’s Mike Fransoso and an RBI single by Somerset’s Alfredo Rodriguez tied the ballgame at three. Neither side could push across the go-ahead run until the bottom of the ninth, when Rodriguez’s two-out RBI single to left gave the Liberty Division the walk-off victory. Neither starter factored into the decision. Long Island Ducks lefty Bennett Parry tossed a perfect inning for the Liberty Division, striking out one. York Revolution southpaw Robert Carson allowed one run on one hit in one inning for the Freedom Division. New Britain Bees righty Evan Scribner earned the win with a perfect ninth inning, striking out the side. Sugar Land Skeeters righty Felipe Paulino took the loss, yielding a run on two hits and a walk in the ninth. Rodriguez finished the night with three hits, two RBIs and a walk. He was named the All-Star Game Most Valuable Player following the jubilant celebration. 2B--Garcia, E 2B,SS (1), Romero, D 3B (1), Fransoso, M LF,RF (1). (1), Fransoso, M LF,RF (1). CS--Rodriguez, A SS (1). E--Casteel, R C (1). LOB--Freedom 4, Liberty 6. DP--A. Cordero(2B) - E. Garcia(SS) - M.
Chavez(1B), A. Cordero(2B) - E. Garcia(SS) - M. Chavez(1B), J.
Valdespin(2B) - G. Pierre(3B) - D. Washington(1B), V. Frias(SS) - K.
Wade(P) - M. Chavez(1B), R. Casteel(C) - E. Garcia(2B). Valdespin, J, Washington, D, Walton, J, Galvez, J, Rodriguez, A.